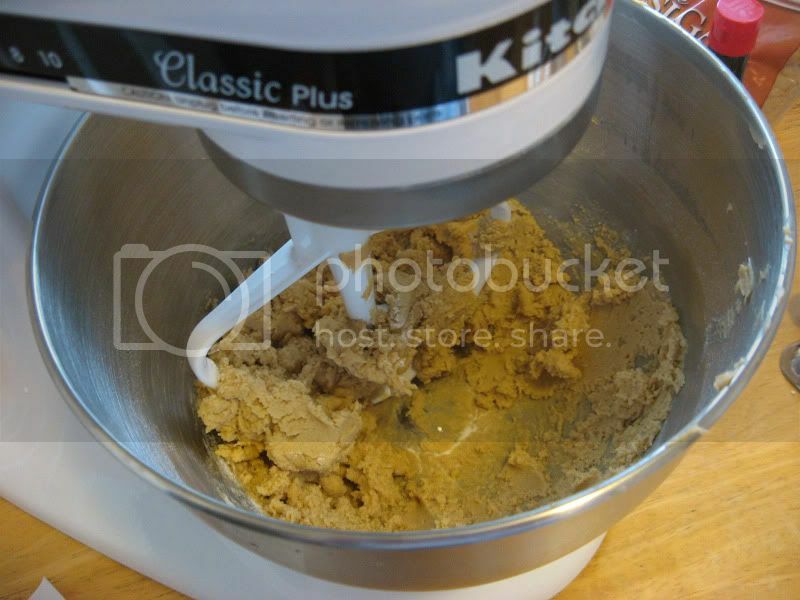 I have finally entered the modern age of baking with a Kitchenaid stand mixer! The only bummer is that I had to get it in white. I would have preferred a color, but the ones that had color options were a lot more expensive, so... oh well. I have already made three different kinds of cookies today! Don't worry, they are mostly for this holiday potluck thing at work we're having in a couple days, so they're not all for me. That would be crazy. So what did I make? I made some peanut butter balls, soft pumpkin cookies, molasses cookies (a gluten-free variety! 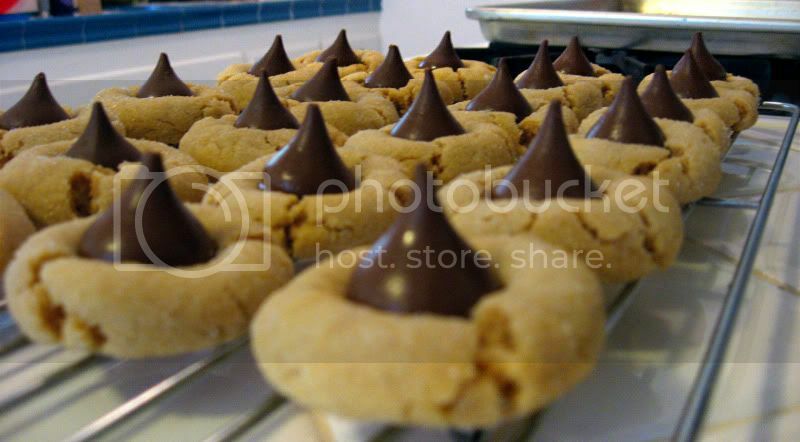 ), and these peanut butter blossoms. I'm sure everyone has had these at some point in their lives. They were always one of my favorites to make as a kid. I found an interesting variety of different recipes online, and kind of just tweaked one to go with the ingredients I wanted. I also halved it, because 48 seemed like way too many. Actually I halved all the recipes today, otherwise it would just have been too much of a cookie explosion up in here. 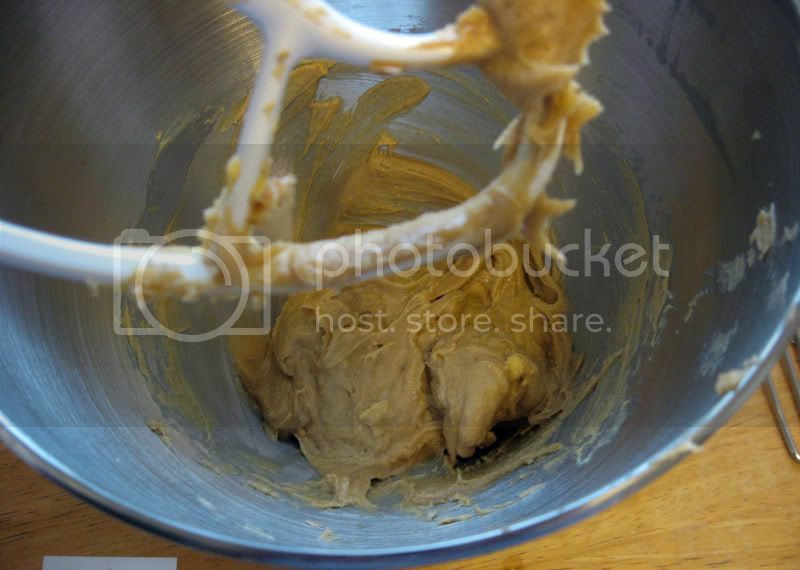 Mix together the peanut butter and the shortening until smooth. Add in the sugars, egg and vanilla and mix until incorporated. In a separate bowl (if you so desire, I rarely do), mix together the flour, salt and baking soda. Stir in the flour mixture into the wet ingredients. 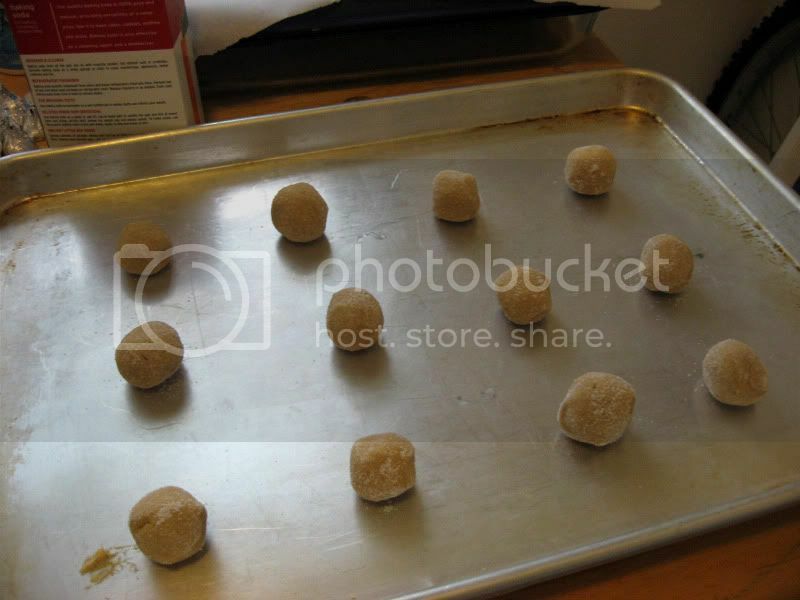 Roll dough into 1-inch balls, rolling them each in sugar and placing them about 1 inch apart on an ungreased cookie sheet. Bake for 8-10 minutes. While they're baking, unwrap the Hershey's kisses. 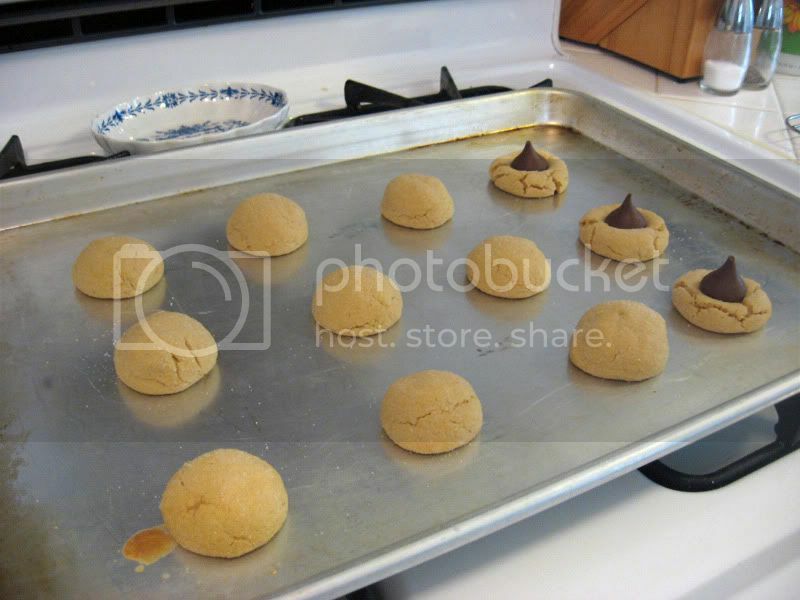 Once you take them out of the oven, each cookie gets one kiss in the middle. Remove to a wire rack to cool completely. This is the peanut butter and the shortening. And this is after everything else is put in. I forgot to take a photo of the in between step. It looked much the same, you're not missing a lot. Here they are, all rolled in sugar and ready to go in the oven. You'll notice they do not get a lot bigger, so you can't make them too small or the kisses won't fit. Here you can see some plain ones before kisses, and a few after. 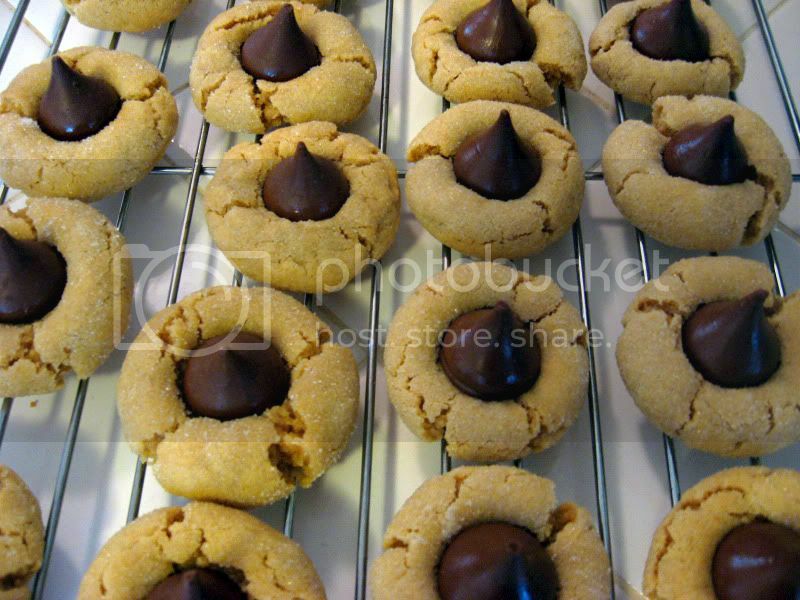 These cookies are especially good for those who like Hershey's kisses. I am not a huge fan of just plain chocolate like that, so I am not quite as gung-ho. But like I said, these aren't for me, they're for a party! I thought I was the only person who loved to bake who still operated with the good ol' fashion hand mixer! I've been holding out for the stainless steel one and I finally hope to get it in 2011!! YAY for your mixer!! I'm sure it's going to result in way more baking! stainless steel stand mixer that is. That's wonderful! What a great birthday present. Do you love it? Now, the very first thing to put on your Christmas list - a beater blade. Trust me. I know it doesn't seem possible, but it will make your mixer even MORE simple to use. @Shunta - Yes, it has been something of a challenge to keep working with a hand mixer sometimes. Hope you get the joy of a stand mixer next year! I use a hand mixer too. Funny I found this tonight-- I made the chocolate mint version of the blossoms. Took pics too, which I should post over at my blogger. Chocolate cookies, candy cane kisses. And I used red and green sugar to roll the dough in before cooking. They're quite festive. Those cookies do sound very festive and fun! Thanks for the link - it raises some very good questions! !